In this heartfelt, beautifully written novel, a woman with nothing left to lose finds the courage to start over in the last place she ever expected. . . Newly divorced Maggie Carter has little to show for her marriage except a pile of boxes and regrets. So when she learns she's inherited an old house and an abandoned gold mine in Eureka, Colorado, she doesn't hesitate to leave Houston behind. In Colorado, she can learn about her estranged father and take stock of her life. After all, where better to decide what your next move should be than in a cabin 10,000 feet above sea level? Eureka is a tiny hamlet with a café, a library, and plenty of intriguing locals. There's the colorful town mayor, Lucille, and her prodigal daughter Olivia, bitter librarian Cassie, and handsome, enigmatic Jameso Clark, who had a fascinating love-hate relationship with Maggie's father. Then there are the soaring views of distant mountains and clear blue sky, of aspen trees and endless stars. Piece by piece, Maggie is uncovering her father's past--and reconciling with her own. And in this small mountain town, she just might find a place where she truly belongs. 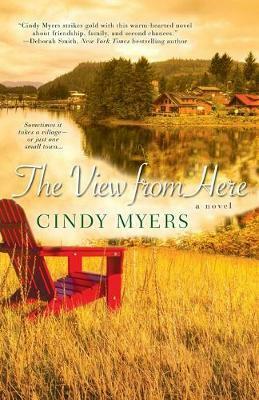 "Cindy Myers strikes gold with this warm-hearted novel about friendship, family, and second chances." -New York Times bestselling author, Deborah Smith Cindy Myers worked as a newspaper reporter, travel agent, and medical clinic manager before turning to writing full time. She's written both historical and contemporary romance, as well as dozens of short stories and nonfiction articles. Former president of San Antonio Romance Authors, Cindy is a member of Romance Writers of America, Novelists Inc., and Rocky Mountain Fiction writers. She is in demand as a speaker, teaching workshops and making presentations to both local and national writing groups. She and her husband and their two dogs live in the mountains southwest of Denver. Cindy Myers worked as a newspaper reporter, travel agent, and medical clinic manager before turning to writing full time. She's written both historical and contemporary romance, as well as dozens of short stories and nonfiction articles. Her novel The View from Here was the winner of the Colorado Book Award. Former president of San Antonio Romance Authors, Cindy is a member of Romance Writers of America, Novelists Inc., and Rocky Mountain Fiction Writers. She is in demand as a speaker, teaching workshops and making presentations to both local and national writing groups. She and her husband and their two dogs live in the mountains southwest of Denver. Visit her on the web at cindimyers.com.